We’re off to the Texas Pinball Festival with truck, trailer, 3 humans, 1 dog, and a whole lot of games. You’ll get interviews from the show, including some random banter with Zach & Greg from SDTM (Zach now owns Flip N Out Pinball by the way!) … and you’ll hear our own James Willing interview Ryan Claytor on the new Coin Op Carnival publication. As luck will have it, that’s also the prize this month from Pinball Life! 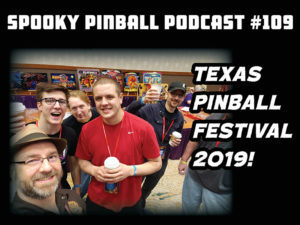 Add in some crazy new bingo action and more random interviews and you’ll get about 2 hours of more Texas sized pinball insanity than you ever asked for!